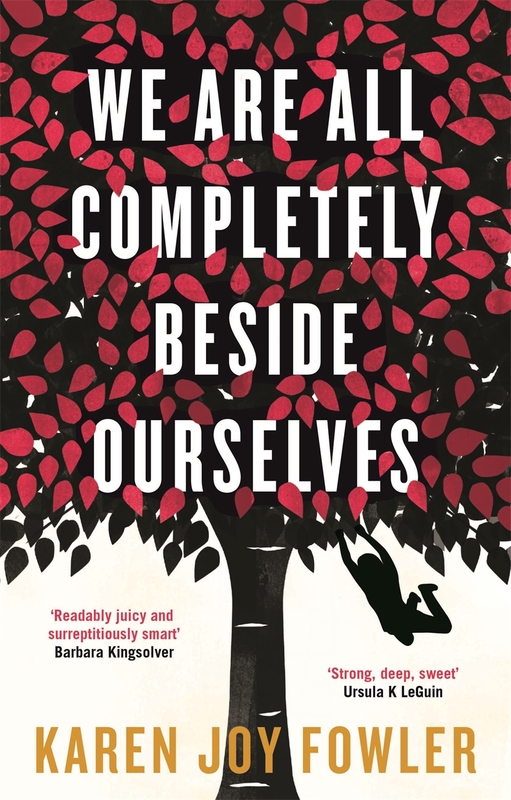 The first thing I said when I finished Karen Joy Fowler’s immensely popular, critically acclaimed, Man Booker Prize shortlisted seventh novel, We Are All Completely Beside Ourselves, was ‘It didn’t land.’ Maybe you’re familiar with this sensation. You can’t say how well you like a book until you’ve read the very last sentence, until the whole thing is over and you can decide whether the way it completes itself completes it. There are prerequisites for this kind of response. First, the book has to be very good. You have to be onboard – not entirely, but to a degree where you want the good book you have to become the great book you crave. You have to be holding out for that moment, even hoping for it, sensing potential. Second, the story has to feel like it needs an ‘Aha!’ moment, where all the built-up appreciation you have for what the author’s been doing clicks into place. My favourite ‘Aha!’ moment in literature is in George Orwell’s Nineteen Eighty-Four: “He had won the victory over himself. He loved Big Brother.” In those last lines, a book with social, cultural and political resonance becomes a story of resonating personal tragedy also. Even without its ‘Aha!’ moment it would be seminal, but those last lines are what make it a classic. So, at first, We Are All didn’t land. I was hung up on the odd narrative structure – in the narrator’s own words, she starts in the middle, and it doesn’t get any more linear from there – and I couldn’t decide where the heart of the story lay. Is it in the narrator’s relationship with her older brother? Is it in her discovery of her own muddy, selfish childhood? Is it a story about her relationship with her estranged sister, Fern? The fact that it was all of these and none of these, that each of these threads was introduced without ever taking centre stage for more than a few short chapters at a time, kept the story away from me. I started talking about it to a friend: I don’t understand why Fowler chose to be so obtuse and schizophrenic in her narrator’s unfolding of the story; I don’t understand which part is truly meant to matter to me: the narrator, the brother, the sister, the truth; and I don’t understand why the moments I think Fowler meant to be resonant were not. I referred to a particular scene. The narrator, then a young woman, is in a lecture hall, and it is revealed by her lecturer that female chimpanzees in captivity are raped by male chimps, sometimes as many as 180 times in three days. This fact moves and horrifies her in a way that escaped me. I read, and I understood, but I didn’t connect. I began to wonder why, and I’ll cut to the quite obvious revelation that turned the entire book around for me: I wasn’t connecting to the narrator’s gendered experience of the world, and at some level to her experience of the world at any level. I wasn’t empathising at all. And I hadn’t been throughout. The more I thought and talked about the book, the more my inadequate reading waxed, the more the author’s imperfections waned, and the more it grew on me. Slowly but with massive certainty, the book landed. I can’t say too much without giving away a small but ruthlessly important twist that comes early in the novel, but truly empathising with the narrator as a woman, and before that as a child with an unfathomably unique childhood, is essential to your appreciation of this novel. I mean, obviously. I don’t think it was Karen Joy Fowler’s fault that I didn’t get that the first time. It was mine. I was waiting for the book to force me to engage emotionally, instead of doing some small legwork myself to see the world through my guide’s eyes. There is a small afterword in my copy of this novel, wherein Fowler details the origins of the story. The slimness of the suggestion that birthed this story is phenomenal for what Fowler made of it. And for my part, the story itself is extraordinary for what it revealed to me about my failings as a reader, about the unrealised and now hopefully expanded limits of my compassion and understanding. Hey James, I’m afraid I’ve resolved to only read books by non-males this year so I wouldn’t be able to get to it until January 2016. Thanks for asking though dude. Hit me up again then if you’re still keen. Great reflection and insight. All I would say is please don’t use schizophrenic as a descriptor. Not only is it pretty rude, it’s not necessary and I’m sure you are intelligent enough to find another word that would work just as well. I’m comfortable with my use of the word in that context. As with most adjectives, “schizophrenic” simply means “of or relating to” a characteristic of “[insert word]”, in this case “schizophrenia”. The characteristics to which I made reference in the paragraph before my use of the word, such as the novel’s apparent internal disconnectedness and the confusing associations it was making between different people, places and times, are in keeping with symptoms of schizophrenia: disconnected thought, disorganized behaviour, tendency to draw associations between apparently unrelated things in a way that can appear nonsensical to others. In the same way that calling something “watery” is to say that something has characteristics of or relating to water, I don’t think there was anything negative or negatively stigmatising in my use of the word schizophrenic. I don’t mean to be dismissive or intractable — my mind is open to being changed — but I haven’t yet heard the argument that will change it. I see nothing wrong with knowing the word’s meaning and employing it correctly; just as I wouldn’t pretend this somehow advances tolerance of and understanding of mental illness, I would also rebuff the idea that this considered, unprepossessing use of the word is in any way harmful. They say you should lead with the upbeat stuff but I find that patronising, so I’ll put it at the end: thanks for reading, Ruth, and commenting. I really appreciate it. Actually, your explanation makes sense. I just often see people using mental illnesses as descriptors and it never ceases to irritate me. However, in most of those contexts they are used without any accuracy as to the things/behaviours they are attempting to describe and are extremely condescending. I concede though that your use of the word is contextually appropriate and in no way condescending or rude.